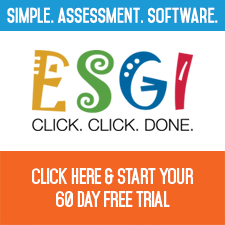 If you haven't yet heard, ESGI is all the rage and is saving teachers hours and hours of time by simplifying assessments for early learners. Check it out today by starting your 60 day free trial. Then, when you win one of the prizes below (wishing you luck), you can simply convert that free trial to the real deal! The holidays are a season of giving, right? In this spirit, ESGI is bringing you the biggest holiday contest we've ever hosted, and wow, do we have an A-list line up! We've partnered with 12 of the "Best of the Best" early childhood bloggers/presenters/content developers for 12 Days of Giveaways! It doesn't matter if you've been naughty or nice, you can enter to win these amazing prizes. Co-sponsoring this super holiday giveaway are... Heidi Butkus, Kim Jordano, Palma Lindsay, Jayne Gammons, Crystal Radke, Mary Amoson, KinderLit, Deanna Jump, Kathy Crane, Kim Adsit, Deedee Wills & Dr. Jean Feldman! Sign-ups will open November 28th. Giveaways will begin December 1st and will end on December 12th. Each day we will be awarding a $25 credit to the prize partner of the day's store and a FREE 1 year subscription of ESGI. On the 12th and final day, you can win a sleigh full of ESGI subscriptions (up to 10) and some great products from Dr. Jean! To enter, all you need to do is sign up to receive the ESGI e-newsletter. For extra points to improve your chances, tweet #esgi12daysgiveaway once per day, follow ESGI on Pinterest, post one of the giveaway ads on Pinterest, and like us on Facebook. Entering is really quite simple, and we cannot wait to get these great prizes into your hands! Older PostChristmas & Winter Thematic Activities on SALE!